How Public are our Public Spaces? We see it all the time these days: a new development is built with beautiful courtyards, open spaces, and roads that connect into the urban context. But who do those spaces actually belong to and who can use them? This is a question that first sparked my interest as I worked on mixed-use and multi-family architecture projects. All included open space, especially those on a large-scale, that was “public space” in disguise. In fact the space was owned by the developer, which meant that they had control over its design, operation, maintenance, and who could use it. The issue came up again on a wider scale, while I was writing my second dissertation on the effects of design-led regeneration on social and economic sustainability. While the strength of the free market has been relied on in recent past as the catalyst for development in urban areas, this dependency has led to a real crisis of public space. This issue remains: how does this effect our communities and the equality of the built environment? 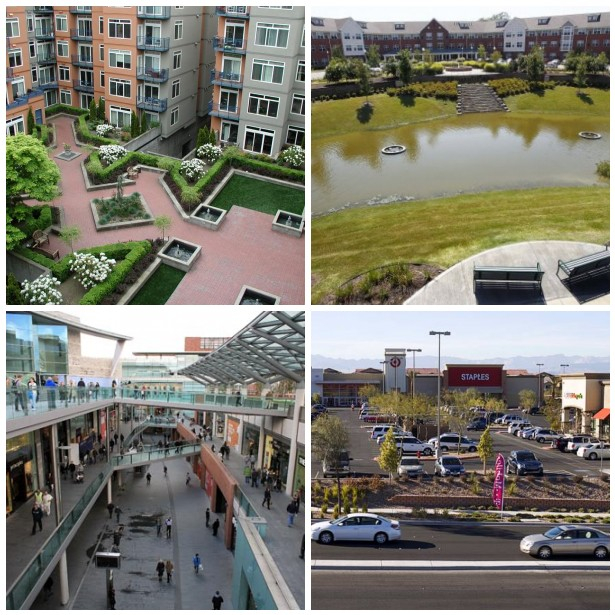 Examples of privatized "public" space in urban and suburban environments. Traditionally public spaces were funded with public money and built by the local government. With a commitment to public service and less emphasis on returns on investment, design decisions could be made for the greater good. Absolutely amazing open, public spaces have resulted from this process, the most famous perhaps being Central Park in New York City. 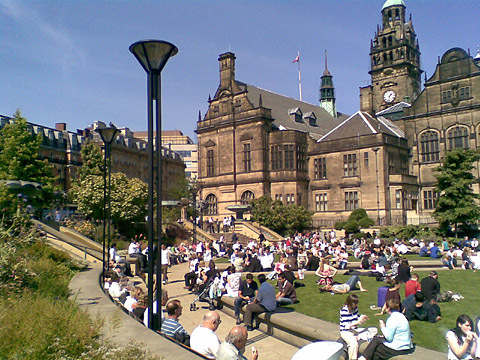 The recently developed, government-led public spaces that I have been most impressed by are in the city center of Sheffield, UK. This city regenerated itself through an enormous investment in civic, open, public space. Organized in a network connecting the urban core with the train station, these spaces have attracted investment and development, including big name companies to headquarter themselves in the city. But most importantly these spaces, some of which can be seen below, are owned and operated by the city for all citizens. You might ask: how do I tell the difference between privately owned “public” space, and real public space? Sometimes it’s really hard to tell. So, then why does it matter? Most developers create open space within their own development as an amenity for users and an attraction to investors, whether they are commercial tenants or home buyers. They manage and maintain it to protect their investment. Unfortunately there can be some very negative side effects on the local community in some cases. With sometimes few requirements by the city to reach a high standard of design, public spaces can become “the space left over” in between buildings. Quality urban open space should have places to sit, landscape elements to create a sense of identity, and use local materials to make it unique to the area. This costs a lot of money, and with developers receiving no direct return on open space investment they often get away with as few physical interventions as possible. Or sometimes they choose to under-design public space because of the effect it has on users. It is common in outdoor private shopping malls to provide very few design-interventions, including seating. 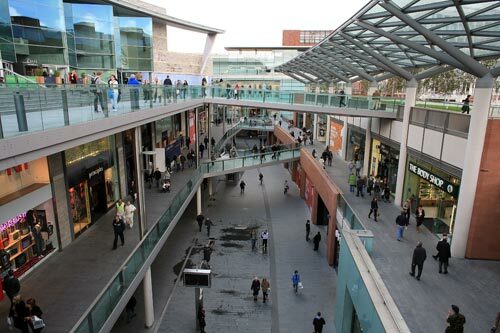 This is to keep shoppers moving: loitering=bad; shopping=good. 2) Who Can Use It? Private commercialized space appears to be open to the public. In some cases privately owned pedestrian routes appear to flow seamlessly from the public street grid. However, if users appear to be the “type” that causes trouble, or the homeless loiter too long, they can be removed from the property. These spaces are often patrolled by security and users can feel ostracized. This is not how true public space should operate. This urban culture can lead to groups of people in a certain demographic or certain communities to feel excluded. The payoff? A gentrified development lacking local identity and culture. With more gated, privatized open space being provided, especially in housing developments, people might feel less inclined to spend time in truly urbanized open spaces, such as city parks. Often times the same demographic can live in an apartment and condo building that has open space only residents can access, which could mean that people are only socializing with people like themselves.While this will allow you to get to know your neighbor, it can discourage you from mingling with people in your local community. When people keep to themselves, social inclusion and community cohesion can suffer. Some would argue that we have bigger fish to fry in the built environment than the ownership and management of open space. And I might agree. But its important to be aware of the issue and how even small changes that arise out of the evolution of how the built environment is design and developed, collectively can have an enormous effect on the strength and inclusiveness of our communities. ← How to Series: Residential Parking.